The National Solar Observatory's Daniel K. Inouye Solar Telescope on Maui in Hawaii is scheduled to begin operations this summer. This summer, the most powerful solar telescope ever built should make its first observations of our sun — but the excitement isn't just for scientists, the telescope team believes. Instead, the National Solar Observatory, which is building the new Daniel K. Inouye Solar Telescope, wants to make sure that middle school students living near the telescope, on the Hawaiian island of Maui, get just as much from the brand-new instrument as scientists around the world will. That's how a science curriculum called Journey to the Sun came to be. Its goal is to make solar science in particular and astronomy in general interesting and relevant to students growing up on Maui. The new facility is being built on Maui because, perched on the volcano called Haleakalā, the telescope will escape nearly all the effects of dust and turbulence that can interfere with observations of the sun's wispy outer atmosphere, called the corona. And the telescope itself is cutting-edge. "Some of the specifications they've had to build to, they blow my mind on a regular basis," Raftery said, comparing the instrument to a piece of art. "The feats of engineering that have gone into this are really quite masterful." Take, for example, the mirror — 13 feet (4 meters) across and so smooth that if it were blown up to cross the continental U.S., the largest bump in its surface would be shorter than a dime's width, Raftery said. Then, the entire instrument is mounted on a massive rotating platform that ensures the telescope will keep pace with the sun's apparent rotation during its journey across the sky, permitting sharper images. As the observatory adapted materials to build the curriculum, the team was careful to highlight Hawaii's long history of astronomy. "We just tried to make it more place-based and relevant to them," Tishanna Ben, an education and public outreach specialist at the National Solar Observatory, said of the project. That included centering the first lesson plan around astronomy in Hawaiian history and culture. Kathryn Young teaches astronomy as an elective to middle school students at Samuel Enoka Kalama Intermediate School near the facility and used the curriculum earlier this school year. "It's really neat to teach here, absolutely, with all our ties to astronomy," Young told Space.com, calling Hawaiian wayfinders who first reached the islands and navigated by the stars "the premier astronomers of the time." Young said that local connections to the sky still hold power with her students, who particularly enjoyed learning about constellations. The students learned about navigating by celestial landmarks like the Southern Cross, and they learned about how different cultures have seen constellations like Scorpio, the tail of which Hawaiians dubbed the Fishhook of Maui. In later lessons, the curriculum focuses in on the sun itself, explaining topics like the electromagnetic spectrum and how stars form. "I really liked the whole lesson on the sun — it was really fun and educational. I learned a lot," Saralana Zender, an eighth-grader in Young's astronomy class, told Space.com. But what really stood out to her, she said, was looking through the solar telescope. "I think we even saw a little prominence [a loop of plasma stretching off the sun]. It was really cool." The sun's activity includes solar flares and prominences, both on display in this image. National Solar Observatory representatives said they hope that kids like Saralana and her classmates will cross paths with the telescope again someday — as adults, there to work at a premier science facility. 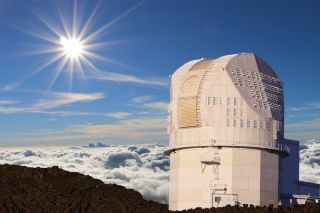 The organization hopes that once the new solar telescope is operational, it will become as well-known as the telescopes found on an island farther south, on the peak of Mauna Kea. "What we would love to see happen is that [in the future], Maui is to solar astronomy what the Big Island is to nighttime astronomy," Raftery said. That's a complicated association in Hawaii, where these mountains are sacred places. Scientists' quest to build the Thirty Meter Telescope on Mauna Kea encountered years of protests and legal battles. Raftery and Ben have had to navigate tensions on Maui as well. "I do understand where they're coming from," Ben said, mentioning conversations she heard as she grew up in Hawaii about sacred landscapes and their appropriation by outsiders. Both are deeply sympathetic to those who oppose the telescope, which is partly why the pair is focused on building real relationships with the telescope's neighbors. Ben said she hopes the astronomy community can do more to recognize that "both sides are valid and that the people that oppose it do so for their own personal and valid reasons." But many neighbors who don't oppose the telescope see it as an opportunity for their children and their communities, Raftery said. And that's why the pair's next goal for the program is to translate the curriculum into Hawaiian, to open it to immersion schools as another step in connecting an astronomical powerhouse on the island with the students growing up nearby. "We like to ignite little fires in the science hearts of these kids," Young said.